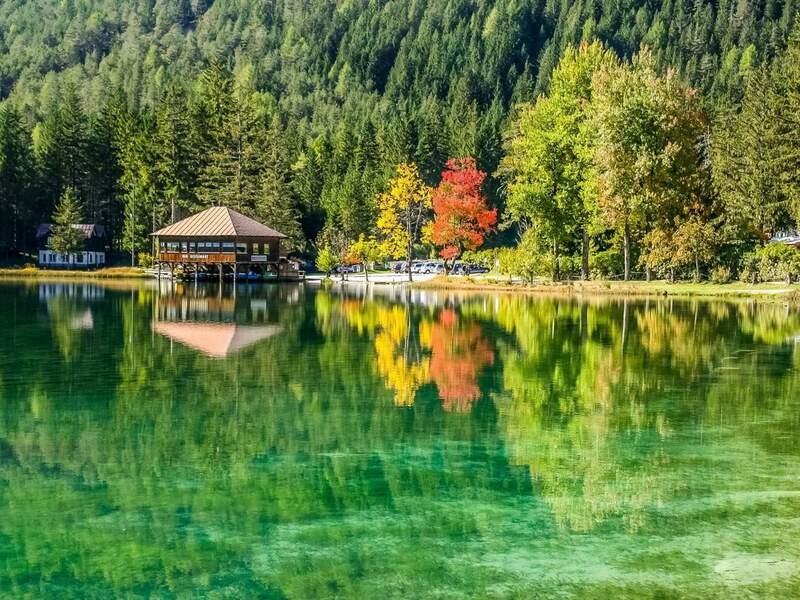 The idyllic Lake Toblach is located in Hochpustertal, in Fanes-Sennes-Prags Nature Park. During all seasons, the educational trail along the shore is a highlight for kids and adults. The lake is perfect for a boat tour in summer and the frozen surface in winter is good for ice skating and curling. 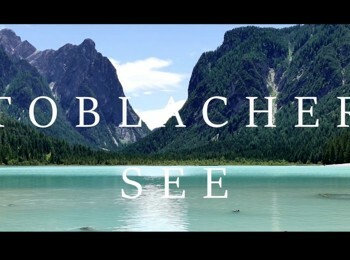 Lake Toblach was formed after the ice age due to mud streams accumulating watercourse to lakes. 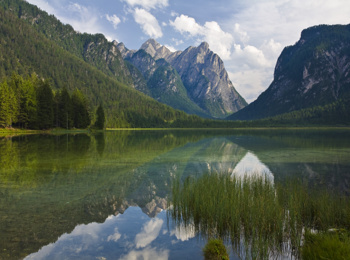 It is located at 1,259 m of altitude, in the Höhlensteintal Valley near of the village centre of Toblach, connecting Toblach with Cortina d’Ampezzo. Rienz river, rising at the famous Three Peaks, flows through Lake Toblach. Around the lake, visitors can find a natural trail with 11 stations displaying information about flora, fauna and geomorphology of this part of Fanes-Sennes-Prags Nature Park. The hike is about 2 hours. With its varied shore vegetation, the lake is an ideal rest and breeding area for many bird species that you can observe from the observation platform at the western shore. During the bird migrations in spring and in autumn, you may be fortunate to see birds of passage that are normally hardly found in South Tyrol. In summer, Lake Toblach is ideal for a boat tour with the whole family. In winter, if the ice is thick enough, the frozen surface is a popular ice skating and curling spot. As well, fishermen will feel like in paradise. However, a fishing license is necessary for foreigners. It can be acquired at the tourist office in Toblach as well as at the restaurant near the lake. A daily ticket must be purchased at the restaurant as well. In 1939, Benito Mussolini had built five bunkers in the surroundings of Lake Toblach, which were part of the Alpine Wall. Thousands of fortifications were meant to protect the Italian border against attacks by the German Empire. Interesting to know: Actually, the fascist dictator Benito Mussolini and the national socialist dictator Adolf Hitler had been alliance partners since the signing of the Pact of Steel in May 1939. However, Mussolini built nearly 50 bunkers only in Hochpustertal between the years 1938 and 1942. Only after the fall of the Berlin Wall, the Alpine Wall definitely lost its importance.